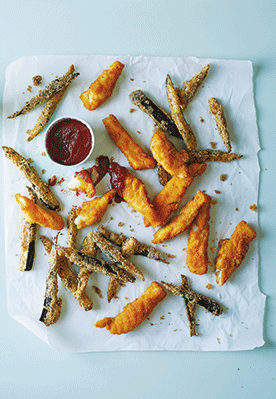 Fish fingers with a healthy twist. The coating is made with ground red lentils, which go bright orange when they are cooked with turmeric and paprika. Crunchy and delicious with not a hint of white flour or breadcrumbs, these are an excellent way of getting some extra fibre and iron into an ultra-picky eater. 1. Pat the cod strips dry with kitchen paper. 2. Measure the lentils, paprika and turmeric into a food processor, season with salt and pepper, and blitz with the grinding blade until you have a fine flour. 3. Set out three plates – the first for the flour, the second for the egg and the third for the red lentil mixture. 4. Dip the cod strips into the flour, then the egg and finally into the red lentil mixture. 5. Place a large frying pan over a medium heat, add the oil and leave until it is sizzling. 6. Using tongs, carefully place the cod strips in the pan and cook them for a few minutes on all sides, or until the fish is cooked all the way through and the batter is crispy and slightly browned. Dip the cod in milk instead of egg.